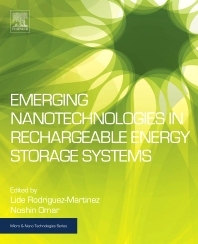 Emerging Nanotechnologies in Rechargeable Energy Storage Systems addresses the technical state-of-the-art of nanotechnology for rechargeable energy storage systems. Materials characterization and device-modeling aspects are covered in detail, with additional sections devoted to the application of nanotechnology in batteries for electrical vehicles. In the later part of the book, safety and regulatory issues are thoroughly discussed. Users will find a valuable source of information on the latest developments in nanotechnology in rechargeable energy storage systems. This book will be of great use to researchers and graduate students in the fields of nanotechnology, electrical energy storage, and those interested in materials and electrochemical cell development. Lide Rodriguez-Martinez is group leader and research manager at CIC Energigune, Spain. Since obtaining her PhD from Cambridge in 1999, she has conducted significant research in the field of solid oxide fuel cells and batteries. She worked 14 years in energy conversion and energy storage technology development at IK4-Ikerlan. She is the group leader of lithium based, and Li−S research line managerat CIC energigune since 2015. Her main interests are the development of cutting edge energy novel concepts, such as Li−S and technology assessment towards competitive targets (performance, life and cost), . Noshin Omar is the head of Battery Innovation Center at Vrije Universiteit Brussel (VUB). He obtained in 2012 his PhD degree in electromechanical Engineering Sciences from VUB. He was awarded a tenure track He is now coordinating several national and European projects in the field of characterisation, electrical, thermal, electrochemical and lifetime modelling of various rechargeable energy storage systems. He was and is still active in various European projects such as SUPERLIB, BATTERIES2020, FIVEVB. He is author of more than 110 scientific publications.